Research aims: This study examines the impact of cross-cultural differences on capital budgeting systems. Design/ Methodology/ Approach: Drawing on the contingency theory, 67 non-financial firms listed in Indonesia and Australia were analysed on a comprehensive range of capital budgeting systems. Research findings: The findings support our predictions that relative to Australian firms, the Indonesian firms were found to emphasise more on sophisticated capital budgeting systems (e.g. real options). The results seem to be driven by Indonesia’s higher level of perceived environmental uncertainty coupled with Sharia governance rules that aim to mitigate risky transactions. This study also provides evidence to show that the emphasis on sophisticated capital budgeting systems was driven by firm size and finance managers’ level of education attainment. Theoretical contributions/ Originality: Prior research has docu- mented an incomplete picture of the link between national culture and capital budgeting systems. This is attributed to the lack of the development of contextual foundations for looking at cross-cultural differences followed by the narrow range of capital budgeting systems being considered in research. Practitioner/ Policy implications: The findings of this study reflect the capital budgeting practices of Indonesia and Australia. The findings are important for practitioners who wish to evaluate project investments in these two countries. Research limitation: Future research should consider looking into how Sharia impacts the use of capital budgeting systems and the performance effects of using different approaches. GRAHAM, Peter; SATHYE, Suneeta. 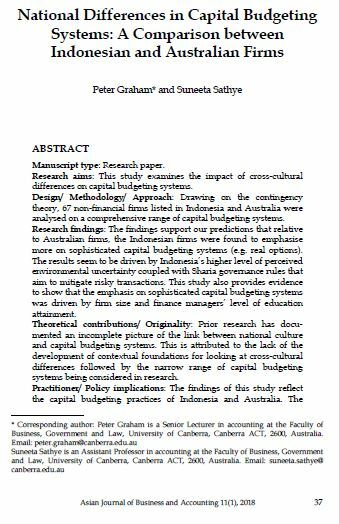 National Differences in Capital Budgeting Systems: A Comparison between Indonesian and Australian Firms. AJBA, [S.l. ], v. 11, n. 1, p. 37-70, june 2018. ISSN 2180-3137. Available at: <https://ajba.um.edu.my/article/view/12146>. Date accessed: 25 apr. 2019. doi: https://doi.org/10.22452/ajba.vol11no1.2.